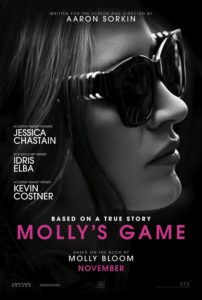 Premiering on Christmas Day, Molly’s Game takes viewers along the titular character’s high-stakes trip through the world of underground poker. Bloom had gone from being an Olympic hopeful in the U.S. National Skiing Team to preparing for Harvard Law, and finally, to running the world’s biggest and most exclusive poker ring. This had set her on the road to an FBI arrest and a federal case against the Russian mafia. And the most interesting part is – it’s all true. 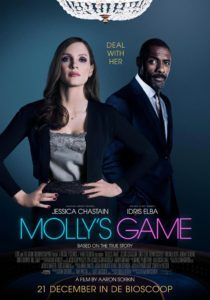 Bloom’s career in underground poker began with her assisting her arrogant boss Dean, who ran an illegal gambling ring. After quickly absorbing the rules for herself, she set up her own shop, commanding a $10,000 admission fee. Before long, she had moved on to host high-stakes games in cities like Los Angeles, Miami, Las Vegas, and New York, requiring up to $250,000 for buy-ins. The glitz and glamor of these cities, while reflected in the level of play and Bloom’s own alluring persona, contrasted starkly to the illegal and dangerous nature of her gambling dens. One of the most prominent was Sin City – a world renowned gaming center. Las Vegas pricked Bloom’s interest due to it abundance of casinos, that PartyPoker specifies is home to over 200,000 table and slot machine games. Bloom’s poker sessions usually took place in small, private rooms with a single table enough only to accommodate everyone who bought in for that day. At its height, Bloom’s operation allegedly attracted A-listers like Tobey Maguire, Leonardo DiCaprio, and Ben Affleck, as well as business tycoons and affluent members of society. The grand scale of these man-caves, which were witness to millions of dollars being exchanged regularly, is a testament to Bloom’s unshakeable drive. The film gives viewers a glimpse of her psyche and business acumen through relentless voiceovers, but it’s immediately obvious that she knows what she’s doing and is determined to see things through. Unfortunately for her, it did so in the form of an FBI arrest in the middle of the night. Her story, at least, ends well. After fulfilling her required hours of community service and paying a fine, Bloom has gone home to Colorado. She was emotionally moved by the biopic, and now working towards collaborating with women entrepreneurs and helping them succeed – this time, on the right side of the law.